The World Economic Forum at Davos means a congregation of bold-faced names from across nations and industries. It also indicates what communications trends will move to the forefront in the next 12 months. The World Economic Forum in Davos, Switzerland, convenes a who’s who list of heads of state, business leaders, philanthropists, and artists to discuss global issues. It bodes well for PR then that a prominent topic at this year’s gathering was how to best communicate about global problems. Themed "The New Global Context," this year’s forum is taking place through Saturday, drawing 2,500 attendees. Leaders have discussed income inequality, poverty, cybersecurity, lessons learned from the Ebola outbreak, how governments should respond to climate change, and the terror attacks in France this month. The recent decline in trust in public institutions, spurred in part by the release of Edelman’s most recent Trust Barometer report, has also been a hot topic. Communications executives at the annual confab chatted with PRWeek about the trends attendees are buzzing about both on formal panels and on the streets and slopes of Davos. Ketchum CEO Rob Flaherty, who spoke on one of the forum’s global health panels this week, privately pulled a moderator aside to say he was "pleasantly surprised that someone from communications was asked to speak, instead of [only] public health experts." The moderator replied that businesses need communications gurus for their expertise in social media and behavior change to help them tackle global problems. "As the forum grows, members and groups that are here marketing their ideas understand they have to do it in a way that helps them to successfully communicate out to their key stakeholders," says Devry Boughner Vorwerk, Cargill’s VP of corporate affairs. Several panels at this year’s event required attendees to develop communications strategies in response to a global problem. "One panel challenged [attendees] to communicate seven sustainable-development goals within seven days to 7 billion people around the world," Boughner Vorwerk recalls. "So we were brainstorming about the message, the different options, how to get traction, and what the different comms channels are. We also took into account that a lot of the world’s population has technology, while many others do not." Through the forum’s New Vision for Agriculture, Grow Africa, and Grow Asia initiatives, it has supported national agriculture priorities in 17 countries across Asia, Africa, and Latin America since 2008. "Since we started these initiatives, we have been able to build the new vision and work with multiple stakeholders here within the forum to get a global narrative on the steps that need to be taken to address the global food security equation," explains Boughner Vorwerk. Due to multi-stakeholder partnerships with more than 300 organizations, and over $10 billion in investment commitments, the initiatives have benefitted more than 3 million smallholder farmers. "The experience of PR pros in addressing multiple stakeholders – employees, government officials, civil society, the media, and NGOs – is required today to tackle issues because all issues are in an interdependent ecosystem," adds Ketchum’s Flaherty. Burson-Marsteller global CEO Don Baer noticed at this year’s event that people want chief executives to communicate about the core economic value and benefits of their businesses. "Just like a company’s CSR efforts, the public wants to actually hear about how companies and businesses help to stimulate growth, create jobs, and contribute to a stronger economy," he says. "Communicating that kind of information is crucially important in the environment we are in." Baer says findings from his firm’s Corporate Perception Indicator report, released last October, have been the basis of some of these conversations. 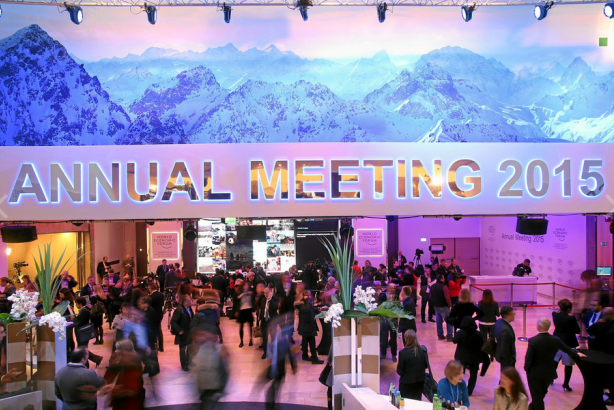 Recent discussions at Davos have centered on the rapidly changing world that has redefined how the public thinks about topics from healthcare to entertainment and technology to financial services, says Ruder Finn CEO Kathy Bloomgarden. In response, Bloomgarden explains that businesses and countries are all transforming to stay competitive. "The hope is that the communications following the dialogue at Davos will inspire people to think differently to solve the challenges we face as a global community," she says. "We as communicators must sharpen a strategic vision, leverage data analytics for targeting and influence, and deeply engage stakeholders to make an impact." One way companies are changing the way they talk about about issues is by connecting journalism, marketing, and PR to create content – a recurring topic Baer spotted at the event. "There is a lot of interest in cooperation and finding good ways to collaborate, which is a big opportunity for the PR field to bring new levels of creativity to the work that we do," he says. Have you heard of Telegram? A company should know its audience and who it is trying to attract when talking about global issues. The next step should be figuring out how to reach them. "Here at the forum, there are so many formal and informal comms channels," says Boughner Vorwerk. "If you’re trying to get an individual or group of stakeholders to buy into your idea, you have got to know channels." She is also a member of the organization’s Forum of Young Global Leaders, a multi-stakeholder community of more than 900 young professionals under the age of 40. She explains that if a company wants to get the attention of that network, for instance, it should use Telegram, a cloud-based mobile and desktop messaging app. "We are using that app to communicate quickly on what is the most important thing going on here at Davos and in the forum," Boughner Vorwerk says. "If you’re not savvy to what channels exist and who is on those channels, you will be missing a huge opportunity." The post-Millennial generation, which includes people aged 15 to 20, is a big topic at this year’s forum. With tastes that differ from those of Generation X, Millennials, and Baby Boomers, the new age group should be on marketers’ radar when discussing global issues. "The new generation has been shaped by the recession, so they believe they need to make money on their own, they are not going to be given it," says Edelman CEO and president Richard Edelman. He adds that this new generation is less trusting of big companies and more concerned about privacy than previous generations. For instance, Edelman says, they are more likely to turn off geolocation on their mobiles. If there is a Twitter storm going strongly in one direction, this new group is also likely to agree with the majority position on a topic, Edelman explains. PR pros also shared their experiences at the summit on social media. Davos: A comms opportunity or hot air from the magic mountain?